…they might be the Dark-side corrupted survivors of Luke’s unsuccessful attempt to train a new Jedi order. Looking at the cast list for The Force Awakens on IMDB, I saw that the actor Mark Stanley (who was in Game Of Thrones as Grenn, Jon Snow’s burly friend on the wall) was cast as an unnamed Knight of Ren. But I don’t remember seeing him in the film (I’m sure I’d recognise him if not masked or rendered CGI), or in fact seeing anyone who looked like a [non-Kylo] “Knight of Ren.” A search via Google Images just returns pictures of Kylo. When and where did Mark Stanley appear? What did he do? And what (if anything) do we know about his character? If there’s anything in the novelisation, that’s welcome information as well. The villainous character in Rey’s flashback? But that character looked exactly like Kylo, with an identical lightsaber. I interpreted that as a premonition of the forest scene. 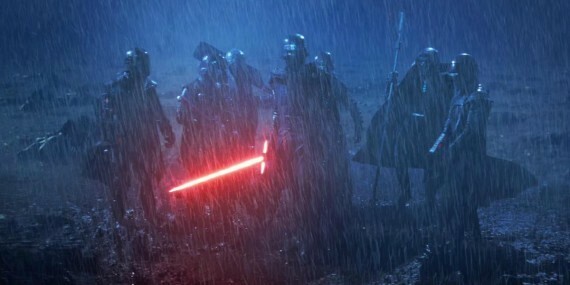 There was a flashback scene where SEVERAL Knights of Ren appeared (no good screenshot yet, sorry), surrounding Kylo Ren, not just him alone. Not the answer you're looking for? Browse other questions tagged star-wars the-force-awakens actors actor-identification knights-of-ren or ask your own question. How does this photo of Kylo Ren fit into The Force Awakens? Where's Vader's mask at the end of Force Awakens? What type of injuries did Kylo Ren receive in the lightsaber battle at the end of The Force Awakens?